The Rozema Award winners will be honoured at the 2019 Edvance Christian Schools Association conference on October 24, 2019 in Ancaster, Ontario. Click here to download the 2019 Nomination Package. Most teachers want their students to be excellent. But what does that mean? Unfortunately, many teachers and schools today have a limited understanding of “excellence” as academic performance. At Cardus, we are committed to teachers who have a more robust sense of excellence that includes but also goes beyond performance and towards nurturing student character, engaging the local community, and improving school culture. The John Rozema Teaching Excellence Award recognises excellence as an ongoing investment into the life of a Christian school community and a positive public contribution to the common good. 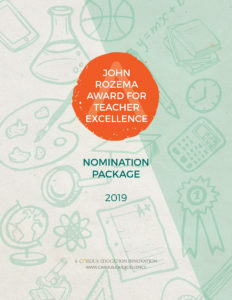 Being shortlisted for the John Rozema Teaching Excellence Award is an indication of a particular educator or school community’s reputation for giftedness and excellent practice. The Rozema Awards are presented in proud partnership with the Christian School Foundation and EduDeo Ministries. We are indebted for their assistance. To view the shortlist and winners of the 2019 Rozema Awards, click here. To view the shortlist and winners of the 2018 Rozema Awards, click here.